On this eve of Epcot's 30th anniversary, it only seems appropriate that I post a picture of the park's icon, Spaceship Earth. This is a slightly unique vantage point, as I shot this from "backstage." This area, normally off limits to guests, was the final stretch of the 5K race during Marathon Weekend, this past January. Although I should have been running at a faster pace, I simply couldn't help but take pictures throughout the course. 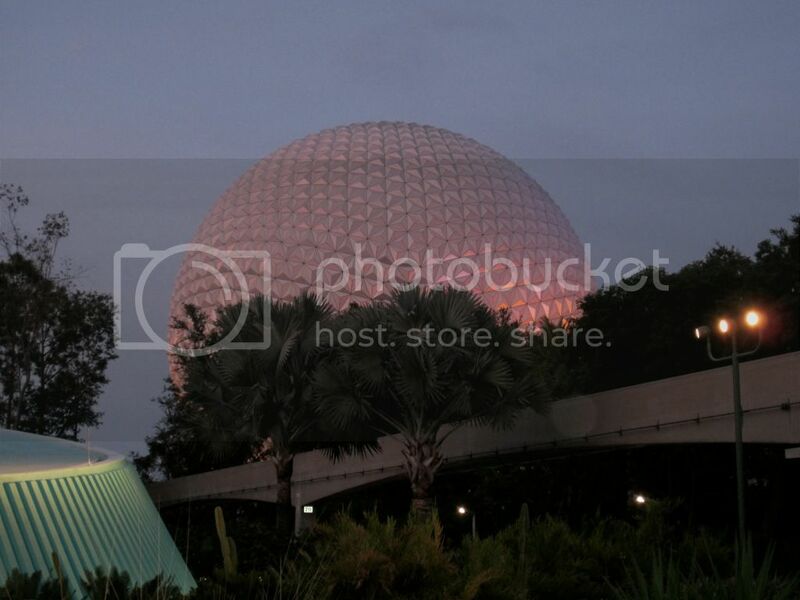 Since Epcot opened on October 1st, 1982, this 180 foot tall geodesic sphere has been often referred to as the "golf ball." If this were an actual golf ball, the golfer would need to be one mile tall! The Odyssey Restaurant is on the east side of Future World, nestled between Test Track and Mexico. It was open from 1982 until 1994 as a counter service dining location. Since 1994, it is only used for special events and private parties. They hold corporate gatherings there on a fairly regular basis. It is also common to see this venue used during the International Food and Wine Festival. On the south side of the building, you will find the first aid center as well as some of the nicer bathrooms in Epcot. I took this shot of Chewbacca at Hollywood Studios back in May. He was in the parade during Star Wars Weekends. This is an incredible event for all Star Wars fans. Guests have the opportunity to interact with their favorite characters and get autographs from some of the actual actors. There are many special presentations and opportunities to pick up some great merchandise. If you are a Star Wars fan and are thinking about planning a trip to Disney World, I would certainly recommend heading down there in May! I shot this picture of the Roger E. Broggie engine while it was at the new Storybook Circus station. This is one of four engines that pull coaches around the Magic Kingdom. Along with the Walter E. Disney, the Lilly Belle, and the Roy O. Disney, the Broggie is an authentic steam engine that was built in the early 1900s. The Roger E. Broggie was named after the first "Imagineer" in the Walt Disney Company. Roger helped build the Carolwood Pacific Railroad at Walt Disney's home, in addition to leading the effort to acquire the locomotives for the Walt Disney World Railroad. Roger was also the first Imagineer to work on the Epcot project. The Hall of Presidents is an amazing attraction for many reasons. In addition to the incredible and lifelike audio animatronic presidents, there are some great pieces of presidential memorabilia in the lobby of the theater. Many of the items are on loan from the presidential libraries and can change from time to time. This picture was taken in March of 2006 and features George Bush's skydiving helmet. He wore this on jumps in 1997 and 1999. He celebrated his 75th birthday with his jump in 1999. He went on to skydive on his 80th and 85th birthdays. Also in this shot, you can see a picture of John F. Kennedy's pet pony, Macaroni. Walt Disney - One Man's Dream is a "must see" attraction for any Disney fan interested in learning about the man who started it all. This video was taken entirely in the entrance foyer to the attraction. It sets the scene for what guests will experience when they take the self-guided walking tour and watch the movie. Walt's own voice can be heard in this video. This "schedule" can be found in the back of the Town Square Theater gift shop in the Magic Kingdom. Like many attractions in Walt Disney World, guests find themselves in a shop when exiting the Princess and Mickey Mouse character greetings. This schedule board is a great example of the attention-to-detail that can be found all around the Magic Kingdom. Most guests don't take the time to read something like this. However, while recently waiting for some guests who I was touring with, I enjoyed browsing it. I got a good chuckle, especially when reading the last line. 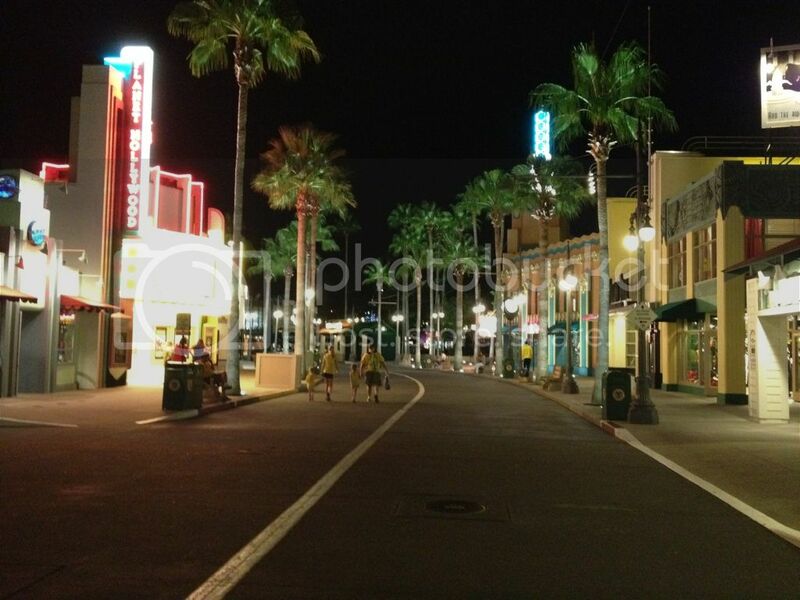 I took this shot while standing in the San Francisco area of the Streets of America in Hollywood Studios. Much like the New York City street, this is a huge mural that is basically flat. It demonstrates the use of forced perspective in movie making. There are two good, yet non-traditional "hidden Mickeys" in the bottom left corner of the scene. You can't see them in this pic, but in the headline of a few papers in the newsstand, there is a reference to the classic Mickey film, Steamboat Willie. Also, in a newspaper "box" you can find a reference to the Pixar movie UP. When I give a tour of the Magic Kingdom, I typically meet my guests at the Transportation and Ticket Center. It usually isn't too crowded in the early morning hours, and it is easy for us to find each other. It also gives us time to get acquainted on the ferry boat or monorail ride over to the Magic Kingdom. I shot this picture about two weeks ago on a beautiful September morning. If you look closely at the Minnie topiary, you can see Cinderella Castle right next to her left thumb. I took this unique shot of the exterior of Carousel of Progress a few weeks ago. The doors on the left are at the exit, while the doors on the right open to the attraction's entrance. The interesting thing is that there are "new" sets of doors in these positions every five minutes. The Carousel of Progress consists of six theaters that hold 240 guests in each. The theaters rotate around a circular stage at the center that is divided into 6 different scenes. The first and last scenes involve the loading and unloading of guests, as seen in this photograph. Debuting at the 1964 New York World's Fair, the Carousel of Progress is the longest running stage show, with the most performances, in the history of American theater. It was located in Disneyland from 1967 to 1973 before being moved to the Magic Kingdom. As a Disney nostalgic, this is one of my favorites. It is one of the only attractions in all of Walt Disney World to have been touched by Walt Disney himself. 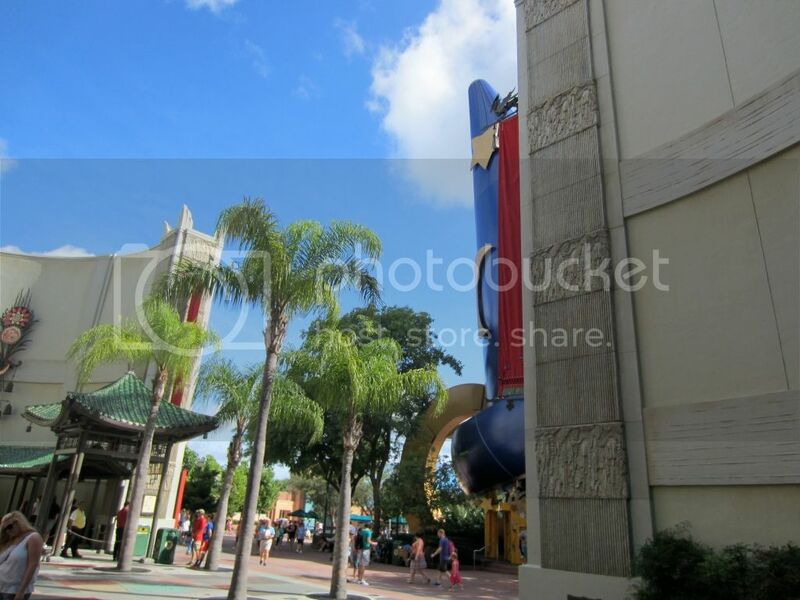 This photo, taken back in August, was taken in the courtyard of The Great Movie Ride at Hollywood Studios. In the old days, when the park was called Disney MGM Studios, movie and tv stars would visit on a regular basis. In a tradition started in Hollywood, California, many of these stars made imprints of their hands in blocks of cement. They can still be seen in this courtyard in front of the iconic Chinese Theater. On a beautiful day in July, I went to the roof of the Contemporary Resort to get this photo. This is one of the only spots where you can get a "straight on" shot of the entire Grand Floridian. You can also see one of the Magic Kingdom ferry boats as well as a resort boat in the foreground on the Seven Seas Lagoon. This large body of water was completely man made, and construction workers removed seven million cubic yards of dirt to create it. Much of this dirt was used to construct the base of the Magic Kingdom where the underground tunnel system known as the utilidors are located. Expedition Everest at Animal Kingdom is the tallest attraction in all of Walt Disney World. Its size allows for some great photo spots from many different angles around the park. I like the way Everest looks in this picture that I shot in May. Because it is relatively hidden behind tall trees, there is the illusion of it being a larger structure at a farther distance. This use of forced perspective is common in all of the Disney parks. The fact that you can't see the coaster from this angle also gives it a more "natural" look. I took this picture at the Dolphin Resort in the winter. You can tell by the blueness of the sky, that this wasn't during the hot and hazy time of year. The Dolphin and Swan resorts are located on Walt Disney World property right next to the Boardwalk and Yacht Club resorts. However, the Dolphin and Swan are not owned or run by the Disney company. They are actually Starwood Resort properties. Although they may not be Disney resorts, they are still very nice places to stay, and they also utilize Disney transportation. Along with a large convention center, there are 17 restaurants and lounges at this resort. You can also find the amazing Fantasia Gardens miniature golf courses adjacent to the Swan and Dolphin. I started using a new camera over the summer and found that it had a nice feature called "stitching." This allows me to line up several side-by-side pictures, which I later connect using computer software to create a panoramic photo. This shot of Town Square in the Magic Kingdom was my first attempt at a panorama. I like the way it turned out, and I plan on continuing to take more photos like this all around Walt Disney World. I took this picture back in July while giving a tour of Hollywood Studios. It was taken inside of the Rock 'n' Roller Coaster gift shop. These were two of my younger guests who were hiding under Aerosmith hats. Often times, the kids don't meet the height requirements for certain attractions, but the parents still want to ride. One of the services I offer on my tours is entertaining the young ones in these situations. As you can see, this gift shop provides for some great photo opportunities! This picture was taken in July, shortly after the new Dumbo "queueless queue" opened in Storybook Circus. Creating this enclosed (and air conditioned) waiting area was an ingenious idea by Disney. Dumbo can sometimes have waits of 45 minutes to an hour during the busy summer months, and it could be very uncomfortable waiting in the Florida sun. Now, families come into this very well themed playscape and both the children and adults are happy. Guests are given a flashing buzzer, much like you'd get while waiting for your table at a restaurant. When it goes off, it is time to head outside and enjoy Dumbo. Even if you don't care about actually riding Dumbo, this is still a great place to come inside and cool off. Parents can sit on benches and relax while the kids run around and play! I took this shot last month while standing near the exit to Big Thunder Mountain in Frontierland. When I am giving a tour, I always like to snap a few "on-ride" photos for my guests. This is a perfect spot, since you can see who is on the train when it comes around a curve about five seconds earlier. This gives me just enough time to line up the shot and get the camera focused. Most of the time I get a pretty decent picture of my guests enjoying one of Walt Disney World's iconic attractions. I took this shot inside in the Carolwood Pacific Room over at the Villas at Disney's Wilderness Lodge. This room is located right off the lobby of the Villas and contains these important pieces of Disney history. In 1950, even before Disneyland was built, Walt Disney created a miniature one-eighth-scale live steam railroad at his family's Carolwood estate in Los Angeles. These are two of the original freight cars used on that railroad. It is fun to be able to see items that were a major part of Walt's life, and I encourage guests to visit the Wilderness Lodge to see them in person. The Tomorrowland Terrace Noodle Station is a quick service restaurant on the Main Street side of Tomorrowland. The actual restaurant is only open during the busiest times of year, but the seating area is almost always open. It is a nice spot to get away from the crowds if you have to make a phone call or write a quick email. When I'm giving a tour and my guests are at a table service restaurant, I often like to head over to Casey's for some corn dog nuggets and then head up to this area to eat. They often have "Wishes Fireworks Dessert Parties" at the Tomorrowland Terrace as there are great views of Cinderella Castle from here. 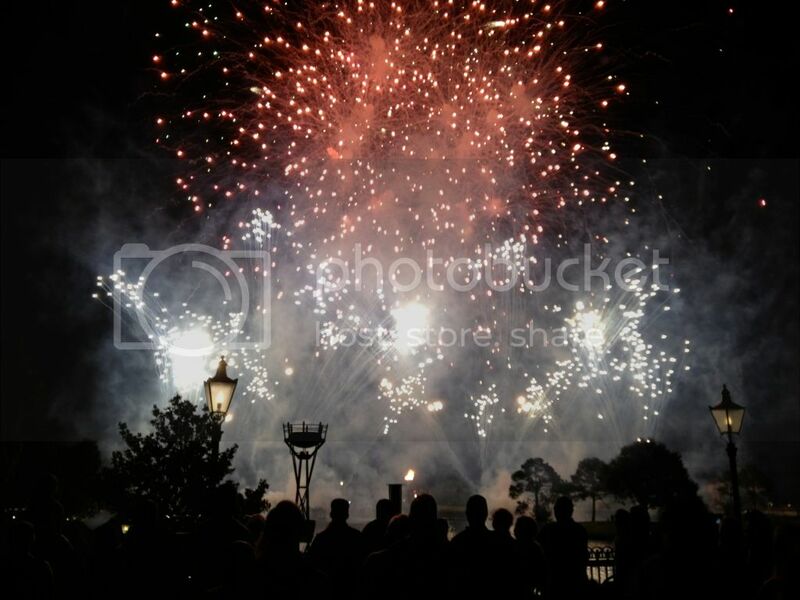 I took this shot of Illuminations back in May. I was standing on the bridge from the United Kingdom to France with some friends. This amazing show contains over 1,100 fireworks shells and costs approximately $25,000 per night. There are several great nighttime shows around Walt Disney World, but this is my favorite. Performed every night at 9:00, it should be seen by every guest at least once on each vacation to "the world." Here is another shot of the new Lion King section of the Art of Animation Resort. I took this picture in August, just before the official opening of this wing. This kids play area features the hyenas hovering over the elephant graveyard. The Lion King section opened on August 10th and it features 320 family suites. The final area of the Art of Animation Resort is scheduled to open on September 15th. It will be themed to The Little Mermaid and will contain 864 standard value rooms. I took this picture on the morning of an Animal Kingdom tour last month. The angle of the morning sun makes for some very nice photo opportunities at this park. Whenever I give a tour here, my guests are amazed when I tell them that this huge piece of land was just a cow pasture less than 20 years ago. During the construction of the Animal Kingdom, 60 trucks of dirt were delivered to the site every single day for 2 years straight to create the parks landscape. Also, 4 million plants were planted at this park. When walking through the lush greenery, it is hard not to be amazed at what Disney created here. I snapped this shot over in Frontierland last week. This is a quiet area along the "Rivers of America," not far from Big Thunder Mountain Railroad. Many years ago, this was the dock for the Davy Crockett Explorer Canoes. That attraction allowed a group of guests (with a guide) to paddle along the river. Part of this area is now a smoking section, but it is also a nice place to come and relax. The pieces on this checker board are made out of small chunks of wood, keeping with the Frontierland theme. The next time you are exiting Big Thunder Mountain, take a stroll down to this area before racing off to your next attraction. Test Track at Epcot is still undergoing a major refurbishment. It is being converted to more of a "design" theme and it is scheduled to re-open in late fall of this year. In the meantime, an "a cappella" group has been performing in front of the attraction on a daily basis. This talented group goes by the name "Test Track All Stars" and performs a variety of car themed tunes. Although the All Stars are certainly entertaining, most guests are really looking forward to the return of Test Track. I took this picture yesterday in the lobby of Mama Melrose's at Hollywood Studios. 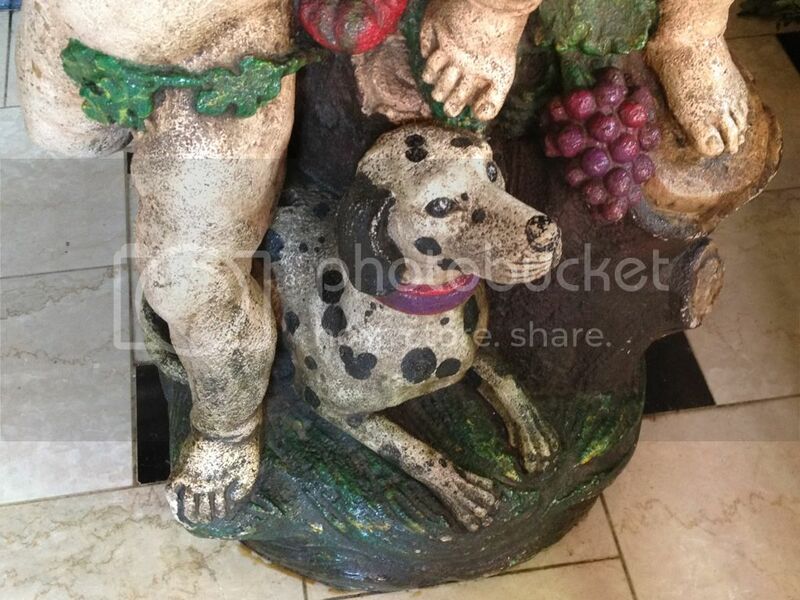 This dalmation statue has a great "hidden Mickey" as one of his spots. There are three other fun hidden Mickeys located in this lobby. The Disney imagineers have done a nice job of placing dozens of these Mickey images all throughout Hollywood Studios. I am looking forward to creating a "Hidden Mickey Tour" in the future. I took this shot as I was leaving Hollywood Studios tonight. This area looks great at night. Although there were only a handful of guests on the street, there were close to 7,000 watching Fantasmic in the Hollywood Hills Amphitheater just a short distance away. Although the crowds at Walt Disney World have lessened quite a bit since the kids went back to school, Fantasmic still seems to fill up on a nightly basis. While giving a tour today, I made friends with this guy in Frontierland. 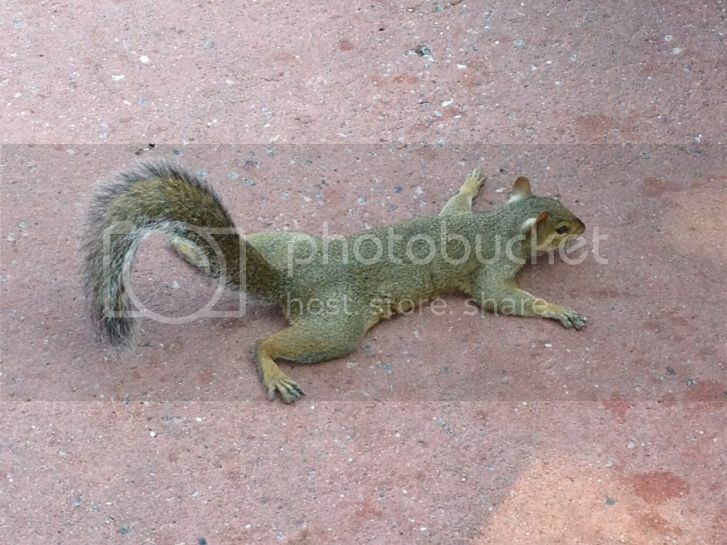 I don't think I've ever seen a squirrel lying on his belly like this. These animals get very close to the guests in the Disney parks. I think they must be used to being around the huge crowds, so they aren't scared of people. I've often said that my favorite park around sunset is Epcot. This picture is an example of why I like it so much. I snapped this shot of Spaceship Earth from the area near The Seas with Nemo and Friends. Disney does a nice job on how they light the exteriors of the pavilions to give them a warm and inviting appearance after dark. I took this shot a little over a month ago while giving a tour of the Magic Kingdom. I thought it was a fun angle when I lined up Prince Charming Regal Carousel with Cinderella Castle. There is an interesting story about the placement of the Carousel just before the Magic Kingdom opened in 1971. A short time before opening day, Walt Disney's brother Roy was standing on Main Street, U.S.A. looking toward Cinderella Castle. He noticed that when looking through the archway, the Carousel was slightly off center. Knowing the attention to detail that is put into any Disney park, it is no surprise that they moved the Carousel to make it perfectly centered when looking through the archway. This attraction sits in the exact same position today as it did on October 1st, 1971. Incidentally, the Carousel is the oldest attraction in all of Walt Disney World, as it was originally built in 1917. I took this picture while giving a tour on the 4th of July. I was sitting in the Columbia Harbour House restaurant, in the second floor area right above the walkway from Fantasyland to Liberty Square. This is what the crowd looks like in the Magic Kingdom on a holiday. If you look closely, you'll see the line for the Haunted Mansion stretches down into Frontierland! Most of the attractions had waits that were more than an hour. A few of them approached 3 hours. Thankfully, I was able to guide my group through the park without having them wait more than 15 minutes for any ride. During the busy times of year, it really pays to use a professional tour guide who knows the best ways to avoid waiting in the long lines.